The septic system is responsible for storing waste water away from your property in a safe manner. As such, it is an important investment that requires routine maintenance and proper cleanup. Choose a sewer company that is well-trained and equipped to keep your septic system in working order. At our pumping and sewage firm, we provide a number of sewer services. Maintain the pristine condition of your plumbing and septic systems with our team. A sewer pumping service is a proactive way to keep your property neat and clean. As its name implies, sewer pumping is a process that removes sewage and waste water from your septic tank. Many septic systems have a certain threshold before they must be emptied. Tanks that are beyond capacity can back up your plumbing system, which drastically increases the risk of flooding and safety hazards. Don’t let flooded rooms and biological waste jeopardize your home or business. Trust our simple and stress-free solution to keeping your plumbing system clean and sanitary. Our well-trained staff uses the proper equipment and procedures to ensure timely and safe service. When you count on us to clean and inspect your system, you are able to uphold the reliability of your installation for the long run. The septic system stores waste from a variety of sources until they must be removed. It goes without saying, then, that a myriad of materials accumulate within your septic system that must be purged. Protect the safety and well-being of guests, patrons, and family with our septic cleaning services. We use advanced equipment and materials to revitalize the efficiency of your installation. Your septic system holds bacteria that help break down waste. However, even if your system is functioning as intended, the prolonged accumulation of waste can prevent your septic system from working properly. In effect, it is necessary to stage periodic cleanings to ensure your system is not overwhelmed. Count on our pumping and cleaning team to be there when you need us most. We take an adaptive approach to all of our services so you can have total confidence in your installation. Our team carefully examines your system so you get the proper service. Since no two systems are ever alike, we work with you so your installation remains functional and safe. Our team can also set up periodic services that work with your busy schedule. More than just the routine visits, we are also available for emergency septic pumping services twenty-four hours a day. 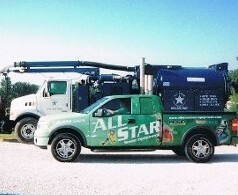 Call us immediately if you experience any trouble or see any waste water in unusual places. We can come out and perform an inspection to see what problems may be occurring. Know the warning signs so that a minor issue does not escalate into a larger, costlier problem. Some of the signs of upcoming trouble may seem minor, but are the first warnings of larger problems down the line. If there is water pooled around the tank, puddles across the surface of your yard, or mud around the tank, the tank may need repair or a cleaning immediately. Alternately, you may notice that the toilet, tub, or drains are not draining properly, or that they are backing up once flushed. These are the signs that our experienced and professional sewer company should check out your system. Contact our sewer company today to request a consultation for our services. We proudly serve customers throughout St. Louis, St. Charles County, Wentzville, St. Peters, and St. Charles, Missouri.